Sometimes the past shows it’s face and you think it is a fun and happy reminder of them olden days. The time when the sun was shining, the grass was greener and the police cars looked as police cars and not an “team happy event cars of fun”. The old days when you actually had to buy your music on a large plate in vinyl called a record. That record was placed on a turntable that could spin the record at 33 0r 45 rpm. That was the connected to a amplifier in a stereo of some sort, if you where lucky. Otherwise connected to a old mono radio-thingy that made a sound quality equal to a shoe box. Then there was tapes. The modern cassettes was replacing the old reel to reel tapes. That oddity 8-track was just a passing fly, an eternal loop with 4 channels. Cassette was the future! No tapes to fiddle with, no reels that can fall of. A small cassette that you can bring anywhere. Honestly what will they come up with next? In the closet was a old reel to reel player. A Sony TC 630, solid state, three heads. A stereo wonder machine with a price tag that made grown men cry when new. A few brave enthusiasts bought them self a TC 630 for a large bag of gold. The quality and reliability was amazing. Listening to a new tape on high 7½ in/s “19.05 cm/s” speed and just marvel of the noiseless sounds of pure stereo. The crystal clear sounds of James Last orchestra! Now dusting of this masterpiece of technology and setting it up after 20 years in a closet. Sound is there, but no speed. The handy man inside you is stepping forward. Dismantle the machine, remove old grease and lubricate different shafts, recondition rubber wheels and belts. Checking the electronics for obvious electrolyte damages. All seems OK, loading a tape and switch the leaver to “play”. The sound is slow, very slow. The next days was spent searching why the tape speed drops. After many hours the fault is located. The leaver that presses the rubber wheel against the gear shaft to the capstan is dragged against each other with help of a tiny spring. That spring is mounted in a way that when the machine is placed in “stop” the spring is extracted. The set to “play” the spring looses up, but is still under tension. A very odd construction. Its almost as the designer made a function that was supposed to break. To remove this spring you need to remove the front of the player, the rubber wheel beside the gear shaft and then you have access to the spring. 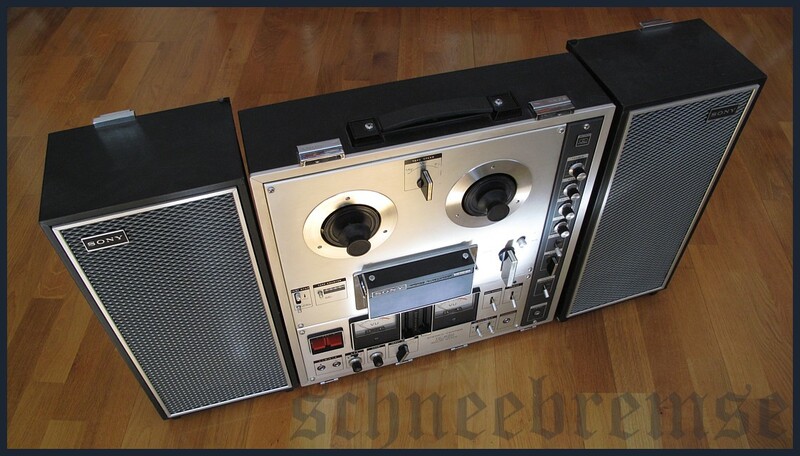 Now the year is 2012, can I contact my local Sony dealer and wanting him to give me a spring to a 1969 Sony TC 630? No, I don’t think that will happen. Searching the internet, no luck. The handy man took the role one step further and made a spring that would fit. Eureka! It works! Now playing old tapes, realizing the sound must be coming out of a speaker covered in a wet blanket. It becomes clear that the tapes is cutting the higher frequency range. After listening for a few hours, the machine was again packed up and placed in the closet. You want to listen to music, and relax. Not spending days after days mending a machine where the parts stopped being made 40 years ago. A brushed steel face plate, back lighted VU meters, green ON lights, RED recording lights, switches and knobs. It is a simply great looking machine, the mojo and appeal is huge! But today we use mobile phones that have capacity with endless source of songs. No records to flip, no cassettes to wind with a pencil, no reel tapes to turn. A small unit that fits in your pocket, easily! Connected to a stereo it gives crystal clear sounds, no flutter, cut or wow. No tape breakages or de-magnetized channels. The development is not standing still, it breaks new grounds every day. You can even take pictures and call your mates with your… phone. So the past was as mentioned placed in the closet again and will be brought out in the light for nostalgic reasons. Only! A memory of a era that is since long passed. Embrace the future, but respect the past. There is a time and place for everything. Sadly the time and place for reel to reel players where 30 years ago in a world of greener grass and black police cars. The equipment is better today, but give me a phone with brushed steel face plate and back light VU meters, any day!